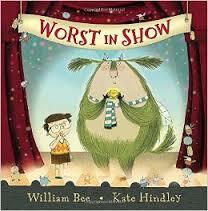 Worst in Show written by William Bee and illustrated by Kate Hindley. Albert has decided to enter his pet Monster, Sidney, in the Best Pet Monster int he World Competition. It had fantastic events like Hairiest Warts, Highest Hover, Most Parasites, Smelliest Fart, and Hottest Breath. “Goodness, the Embarrassment” Albert laments as Sidney loses event after event. But Albert’s embarrassment is turned to joy at the end when Sidney wins Worst in Show for earning the lowest score in 100 years. This is a fun book that can easily inspire kids to write their own topsy-turvy story. Alas, it won’t inspire any new events to the OBHR Games. At Friday’s PD workshop, someone commented that Fly Away Home by Eve Bunting was so sad. It is, but it is also filled with hope. In writing we are using Bunting’s book The Wall, to talk about a time we lost something. Bunting’s new book, Yard Sale, is equally as poignant as the two books above. But, also like them, there is hope and community. Publisher’s Summary: Almost everything Callie’s family owns is spread out in their front yard—their furniture, their potted flowers, even Callie’s bike. They can’t stay in this house, so they’re moving to an apartment in the city. The new place is “small but nice,” Mom says, and most of their things won’t fit, so today they are having a yard sale. But it’s kind of hard to watch people buy your stuff, even if you understand why it has to happen. With sensitivity and grace, Eve Bunting and Lauren Castillo portray an event at once familiar and difficult, making clear that a home isn’t about what you have, but whom you hold close. 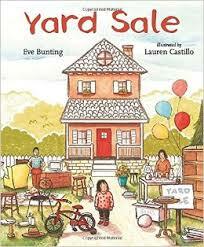 Like many of Bunting’s books, Yard Sale tackles real life problems in a way that will get kids thinking. Reading about Chester Greenwood yesterday got the kids thinking about things they use that can be improved. 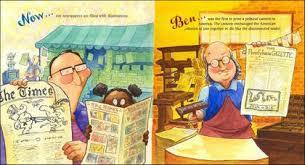 Today, our read aloud looks at Ben Franklin inventions that are still around because the basic design was good. His ideas have just been improved. 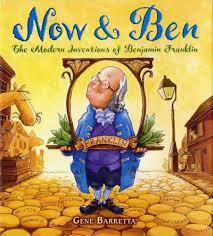 Now & Ben : The Modern Inventions of Benjamin Franklin, written and illustrated by Gene Barretta, features two page spreads that show a modern invention on the left and the Ben Franklin original on the right. The text explanations are simple but point out how Ben Franklin is still relevant today.The end pages playfully depict various inventions of Franklin and the year that they were invented. This book is an excellent tool to add to an inventor’s toolbox. 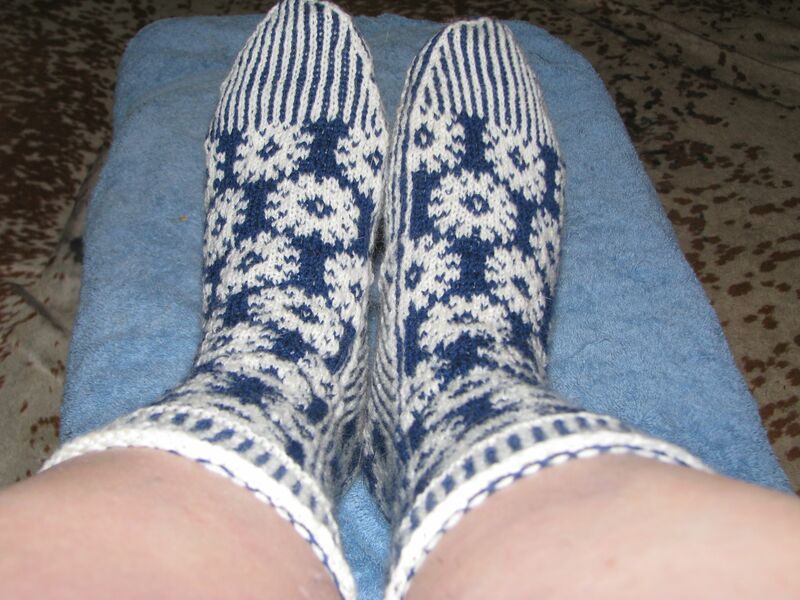 I finally finished my Back to School Socks and the temperature is on the rise again. Here they are. 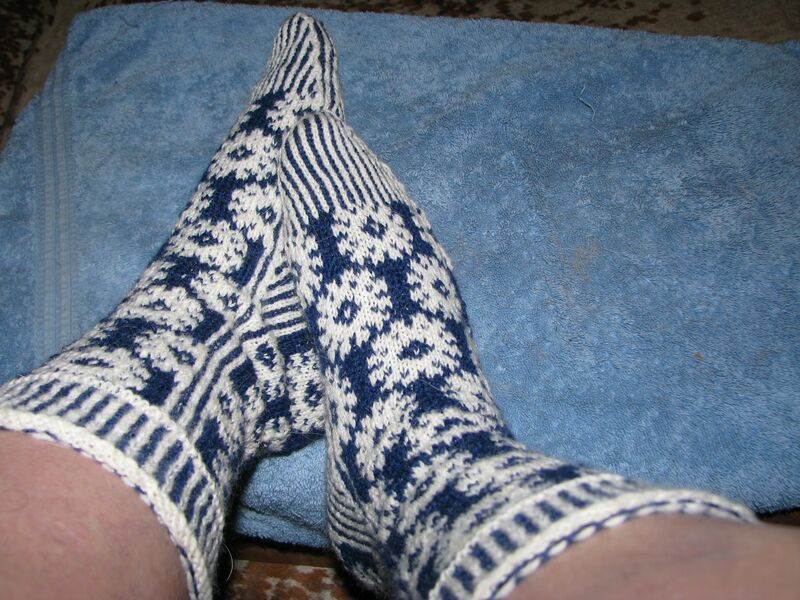 I am excited for the temperature to drop for many reasons, including the opportunity to wear these. 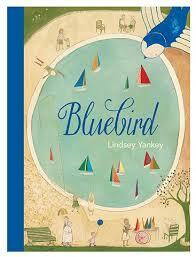 I came across a lovely little book recently, Bluebird by Lindsey Yankey. It is actually a large book, 12″ x 9″, but tells a sweet story in a gentle way, and the artwork is excellent. In poetic language, Yankey tells the story of a little bird, who fears he cannot fly because his friend, Wind, is not there. He sets off on a mission to find Wind. 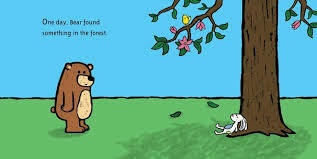 As the little bluebird searches for his friend, we get to see where he lives. There are beautiful details ion both words and pictures. Everywhere the little bluebird goes, things are still; flags droop, kites rest, clothes hang straight down on lines. The little bluebird eventually finds his friend, who was really there all along, but also learns a little bit about himself, too. A beautiful story about the little bird in each of us. And here we are. It is mid-August and we are experiencing a heat wave in Portland. Today will probably be the hottest day of the year, at 99°F. I’m starting to think about returning to work. This is my last full week of vacation. Next week I have a two-day training on Wednesday & Thursday. I get my hair cut Friday, then inservice week begins two weeks from today. Sigh. Although I long for summer to continue forever, I do enjoy the return to a more structured daily schedule. 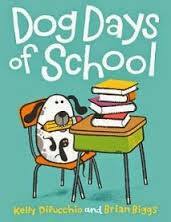 In The Dog Days of School by Kelly DiPucchio, Charlie is in the situation I will be in once we’ve been back to school for a few weeks. Charlie thinks his dog, Norman has a great life, with no homework and very little responsibility. One night, Charlie wishes on a star, hoping to have a life as easy as Norman. When Charlie wakes up the next morning, Norman is in his bed and their roles are reversed. Brian Biggs’ illustrations add some details that DiPucchio doesn’t include in the text, to make this a wonderful book about role reversal and the fact that the grass isn’t always greener on the other side. A great book for k-2 at the beginning of the year, or a few weeks in when the routine has set in and things feel more like a slog. I’m spending a lot of time looking at flights. Air travel is on my mind. And, as always, there’s a book about it. On the funny side, Flight School by Lita Judge is the story of little Penguin who has the soul of an eagle. Alas, his body wasn’t built to soar. But Penguin has an irrepressible spirit, and he adamantly follows his dreams to flip, flap, fly! Even if he needs a little help with the technical parts, this penguin is ready to live on the win. He gets by with a little help from his friends. 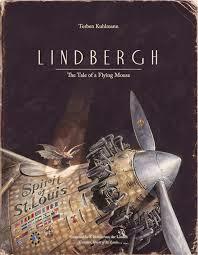 More seriously, we have Lindbergh: The Tale of a Flying Mouse by Torben Kuhlmann. Goodreads Summary: A story of toil and triumph—inspired by Charles Lindbergh’s solo flight! These are dark times . . . for a small mouse. 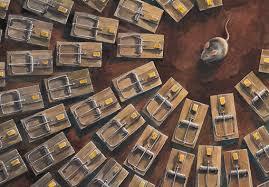 A new invention—the mechanical mousetrap—has caused all of the mice but one to flee to America, the land of the free. 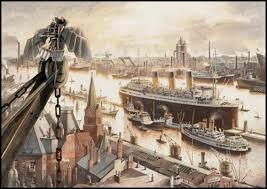 But with cats guarding the steamships, trans-Atlantic crossings are no longer safe. In the bleakest of places . . . the one remaining mouse has a brilliant idea. He must learn to fly! Torben Kuhlmann’s stunning illustrations will capture the imagination of readers young and old with the death-defying feats of this courageous and persistent young mouse. Definitely a book you should take a look at and be inspired. Tags: air travel, Flight School, Flying, Lita Judge, picture book, Torben Kuhlmann. Let me start by confessing I almost cried reading Found by Salina Yoon. It starts of very simply. 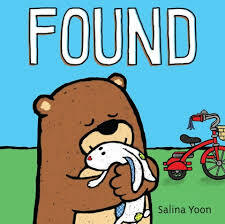 Bear does everything he can to find the owner of the bunny, but to no avail. Then one day, he does. But by then he has grown very attached to bunny. But he does the right thing and goes it back. Even though he doesn’t want to, he knows in his heart it’s the right thing to do. This made me tear up. What Moose, the owner does next, is brilliant. And it is his action that made the tears leak out. 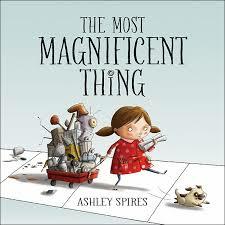 Two really great picture books you and your kids will enjoy.